Your Next Stamp Challenge #52~Sketch By Me! I made this a while back when I still had summer on the brain, and used this adorable set Happy Days Mermaid. The dp is Fancy Pants Designs Beach Babe. 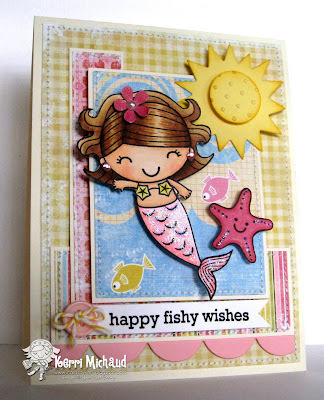 The sentiment comes with the set and the sun was cut with the MFT Die-namics Sun Die. We hope you'll play along with us! Please check out the new challenge on the YNS Blog so you can see the prize up for grabs this time! You will also want to check out the rest of the DT's fabulous creations! This is just so cute! I hope you are feeling a little bit better today! So glad to hear you "survived"!!! :>) Wonderful card and I will definitely be playing along with this sketch! I love when you use this stamp set - this card is so perfect in every way. Thanks for the wonderful Sketch - I'll be using again for sure! how gorgeous i don't know how people found such a great ideas to make this much beautiful card and hand made things . any way best of luck! Hugs dear friend and relieved that you're OK after surgery! The dirty girls have been praying for you and when I didn't see you in the thread, I popped over here to check on you! :-) Your card is adorable, btw! 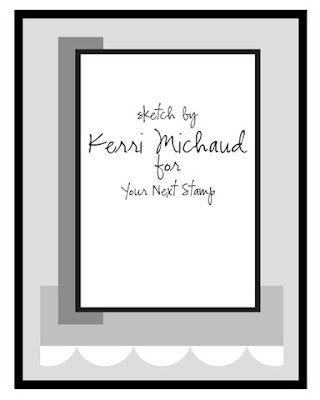 So pretty Kerri, I always get so inspired looking at your creations!